After-School Exercise is Vital for Kids! A new school year is here and every family has a lot of things going on. Sometimes keeping your kids active once school starts back up slips to the bottom of the priority list. But keeping your child active after school has a ton of benefits physically, socially and mentally! We all know that exercise is great for keeping your body healthy, but did you know that regular physical activity can help increase brain function in children, too? It’s true! And bringing your kids to the roller rink at Skate Moore after school is a great way for them to ramp up their exercise, make new friends and increase their energy for learning. Regular after-school exercise can help your kids keep a healthy weight, which creates health benefits throughout their lives. Kids who suffer from childhood obesity are at a much higher risk for developing health issues like diabetes and heart disease as adults. Keeping kids physically active can make a huge difference in behavior. A tired kid is a good kid, and at Skate Moore in Oklahoma City, we specialize in making exercise fun while your little ones wear themselves out! 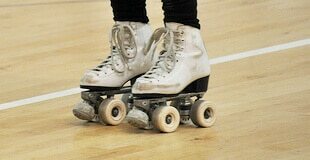 Want to learn more about the benefits of roller skating or blading with us at Skate Moore? Give us a call or stop by for an impromptu skate session! Walk-ins are always welcome during open skating times and it’s a great way for kids to make new friends in a healthy, family-friendly atmosphere.